Okay, so I was caught in a rainstorm last Friday. Over the weekend, I cleaned the bike and notice the rear shifting is not cooperating. It shifts fine from the small cog to the largest, but does not go back down very well. It hangs up and will eventually shift down with a lot of hesitation. I lubed all the pivot points on the rear derailleur but not much of a change. Would the next thing to do is change the cable housing? Any other suggestions for me to look into? Check for gunk in your bottom bracket cable guide and then maybe some spray lube in your brifter. Do you have steel galvanized cables? Getting them wet can easily oxidize them and cause corrosion which will drag inside the housing, preventing your derailleur from shifting down. First thing I would do is replace the cables with good stainless cables. Chances are you won't need to replace the housing. Check for gunk in your bottom bracket cable guide and then maybe some spray lube in your shifter. Depends on how old the cables/housing are. You could have a cable fraying inside the shifter, or it might be time for new cables/housing because of wear/dirt in the housing or your derailleur hanger might be out of alignment. I did check for gunk when I cleaned the bike. Besides, this is a mountain bike converted to be road friendly as my commuter, and the cables come from the top. I think you nailed it. I had been having issues with my shifters and had to replace the cables not long ago. Unfortunately I only had the cheap galvanized cables as a spare. I just threw them on as I had them laying around. I didn't realize they would cause a problem so quickly. Also, being in Southern California, I was caught by surprise with the last storm. Also, what is a good housing that anybody would recommend in case I need to replace this too? Anything from a reputable manufacturer is good. Shimano, SRAM, Jagwire...all good. I would definitely replace the housing, the crap galvanized cables will have created wear inside the housing liner. While the cable suggestions are good, shifting fine in one direction and slowly in the other are classic signs of the need to tweak the barrel adjuster. Try turning the barrel a quarter or half turn and see if that improves things. If it gets better but is not quite there, give it another twist. If the barrel adjuster doesn't completely solve your problem, then lubing the shifter, the derailleur pivots, and replacing cables/casings are your next steps. While the cable suggestions are good, shifting fine in one direction and slowly in the other are classic signs of the need to tweak the barrel adjuster. Shifting fine from small cog to large, but not back down the cassette is classic cable drag. Especially if it happens after riding in the rain... with galvanized cables. Barrel adjusters don't just go out of wack from rain. But there's nothing to lose by turning a barrel adjuster to be 100% that doesn't fix it. My next step after that would be look for gunk in the cable guide below the BB. Rain riding tends to throw muck there. Probably a good idea to get stainless steel cables regardless but I'd explore free steps first before jumping to new cables if you don't want to spring for them. Thanks folks for the ideas. I did try turning the barrel adjuster and it didn’t help at all. After cleaning the whole bike and lubing all the pivots, no improvement. I didn’t realize the galvanized cables would cause such a problem after the storm, so it didn’t occur to me that that would be the problem. I got the stainless steel replacement cables, but now thinking I might as well get new housing as well. Not sure what the cheap cables could have done on the interior of the housing. Just as well as to re-boot and start with fresh cables and housing. I'm having the same problem on my bike that's a permanent fixture on my smart trainer. The rear cable was replaced recently and is unfortunately not stainless, but doesn't get exposed to weather so I'm assuming that's not causing the shift issues. I've adjusted the bajeebers out of the barrel adjuster to no avail... down shifting is still 'iffy'. I did notice my chain is badly stretched and a new one will be here Thursday, so I'm hoping that'll resolve my issue... I'll report here if it does! If the housing has some miles on it, you may as well replace it. If less than 2K miles or so, I wouldn't bother. The galvanized cable isn't going to rip up the inside of the housing in a NY minute. It's probably the same thing. Just worse. Rain doesn't contain salt. Dripping sweat does. Yup. Sweat is 10x worse than rain. As others have posted sweat is much more of a problem than rain. Also chains don't stretch. Pins, bushings, and rollers wear...the chain gets longer but no part of it 'stretches'. Also chains don't stretch. Pins, bushings, and rollers wear...the chain gets longer but no part of it 'stretches'. I'm well aware of the mechanics of chain wear... no one that I know says, "I need a new chain because the physical components of the chain have loosened-up over time, giving the appearance of a longer chain that has stretched but technically didn't." Well you could just say "I did notice my chain is badly worn". 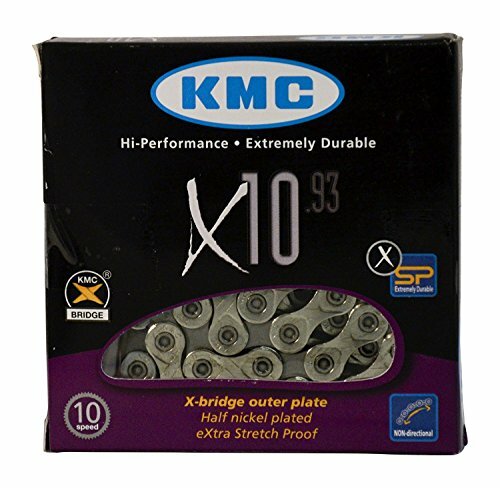 My "eXtra Stretch Proof" KMC chain arrived today and although it certainly helped make my shifting crisp, it wasn't the reason my rear derailleur wasn't down-shifting right. After replacing the chain, I noticed that when my chain was on the smallest cog, the rear derailleur cable was very loose because it had stretched a lot since I installed it a few months ago. So loose that adjusting the barrel adjuster couldn't compensate for the lack of tension. I retensioned the cable by loosening the rear derailleur bolt, pulled the cable taught, tightened the bolt, and made the final adjustments with the barrel adjuster. Now the bike shifts like new. Yeah, yeah, chains don't stretch as in any parts of them stretching. But through wear, the chain gets longer, so it effectively stretches. Cables don't stretch as in the metal cable actually stretching. But they seat further into housings and effectively stretch. To the OP, if your cable needed that much of an adjustment, you may want to check under your hood to make sure it's not frayed. That is were cables wear on Shimano shifters. That will effectively make the cable longer or "stretch" it. If that is the case, it won't be long before it totally breaks. Yea but if it was frayed, it wouldn't be shifting like new after taking the slack out. But it's never a bad idea to check Shimano shifters for fraying. Yea but if it was frayed, it wouldn't be shifting like new after taking the slack out. But it's never a bad idea to check Shimano shifters for fraying.